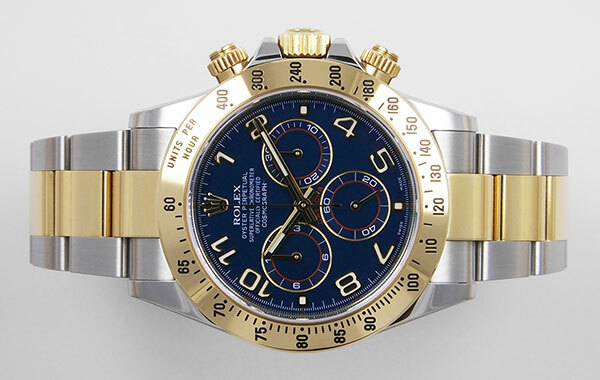 Gentlemen's Rolex Daytona finished in 18K/SS with matching 18K/SS Oyster Bracelet. 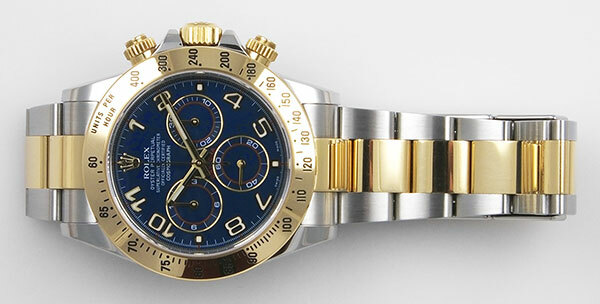 This highly desirable 'Blue Racing Dial' is no longer in production and as a result is now very sought after. 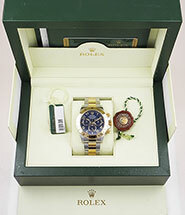 This watch comes to us as a complete set with both boxes, original warranty card, manual and both hang tags. 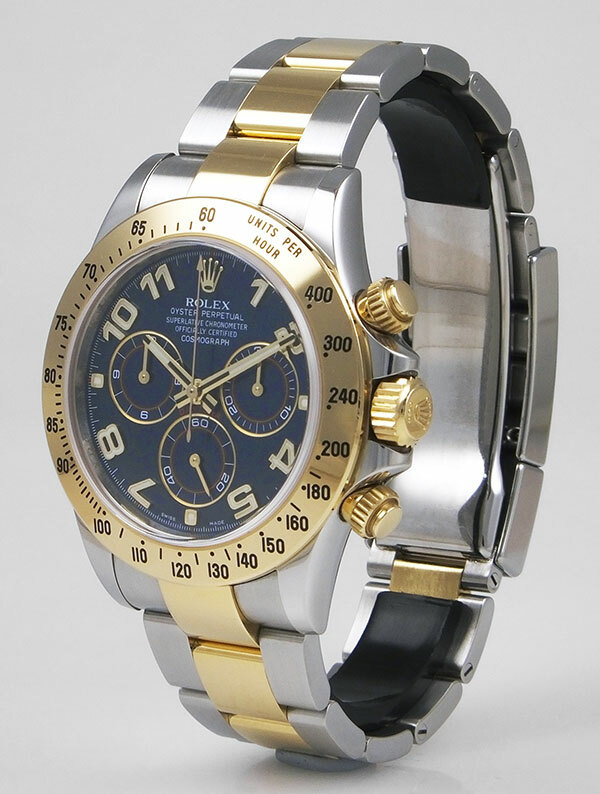 Stainless steel case is in virtually mint condition with polished sides and top. 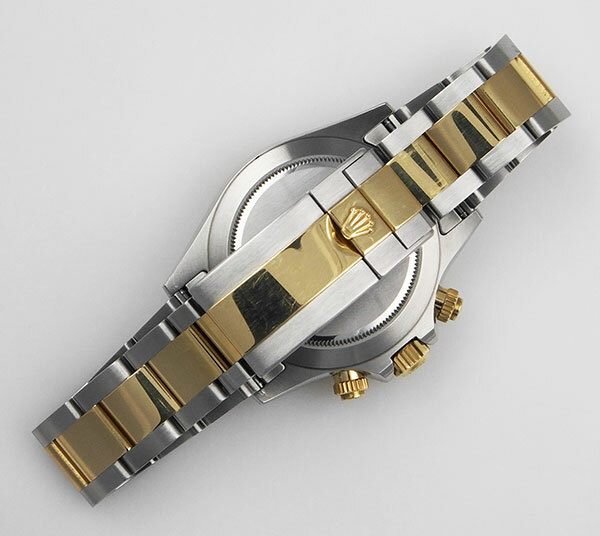 Highly polished finish tachymetric scale bezel also in mint condition as are the matching Triplock winding crown and screw-down pushers. Case is original finish and has never been re-ferbished or re-polished. Case ref: 116523. Serial no: X3190xxx. 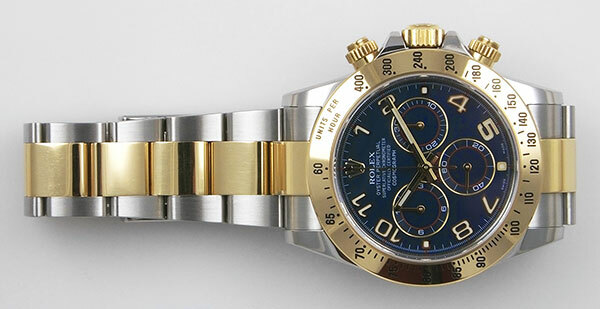 Case dimensions are 43mm (not including crown), 12mm thick and 46mm lug to lug. 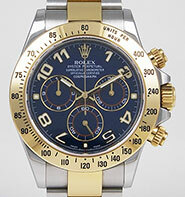 Beautiful dark blue 'Racing' dial with applied gold numbers and matching 'stick' hands. Dial is signed 'Rolex Oyster Perpetual, Superlative Chronometer Officially Certified, Cosmograph' with 'Swiss Made' at 6 o'clock. 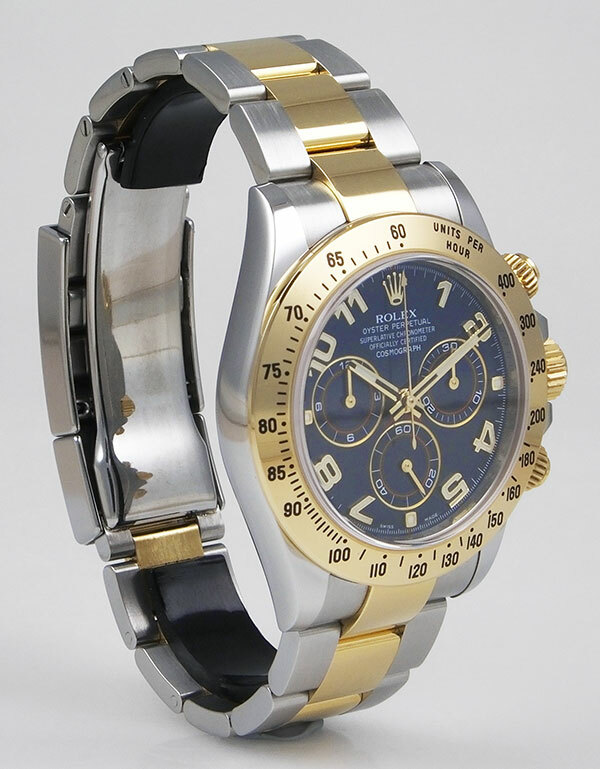 18K/SS 'Easylink' Oyster bracelet with fliplock deployant clasp is in superb condition with ZERO play/stretch in the links - basically 'as new'. Will currently fit approx 8" wrist or can be adjusted. As with the case, completely original and has never been re-finished or re-polished. 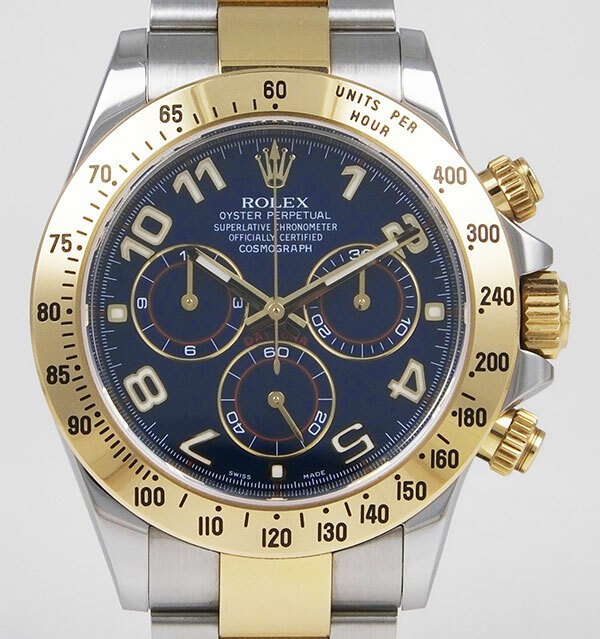 Rolex calibre 4130, Certified Chronometer, self-winding (automatic) Chronograph movement. 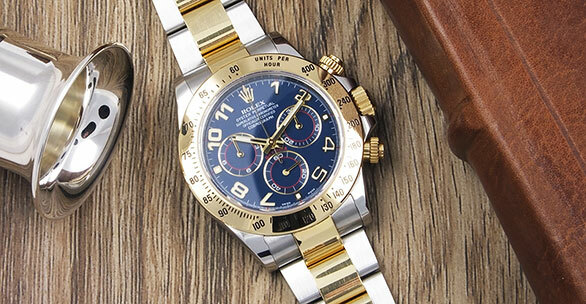 Working perfectly and keeping Chronometer standard time. Full 12 months warranty for total peace of mind. 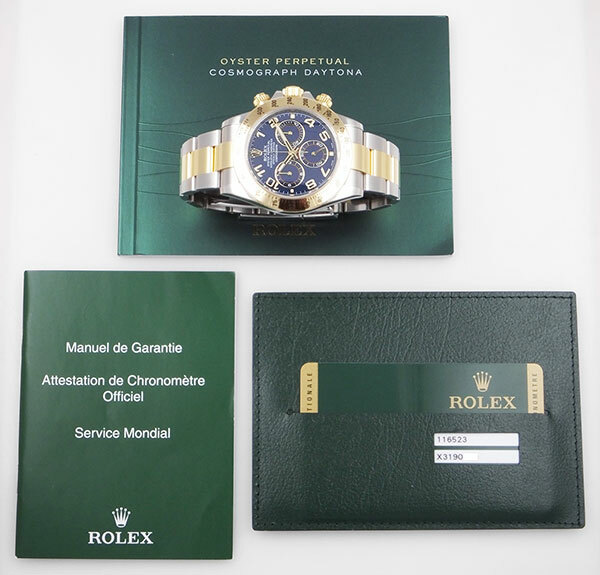 Comes complete with original presentation box, outer cardboard box, service booklet, manual and signed/dated warranty card from when it was first sold. This watch is 100% genuine and rest assured, we give a lifetime guarantee on the authenticity of all the watches we sell.